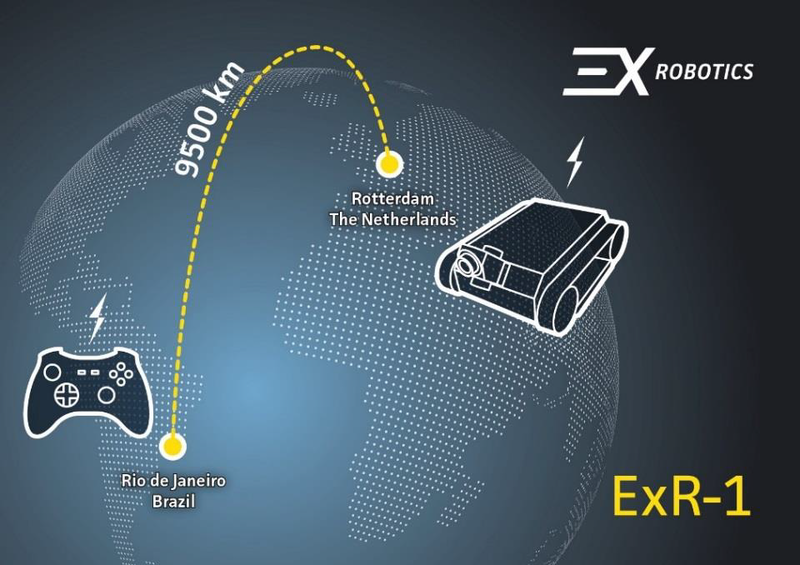 On March 14th, 2018, The ExR-1 robot produced by ExRobotics in the Netherlands was remotely controlled from Rio de Janeiro, Brazil. An operator drove the ExR-1 robot, located at ExRobotics’ facility in the Netherlands, from his location in Rio de Janeiro (Brazil). This test was part of the Shell Sensabot programme. The ExR-1 robots are designed to be deployed at NAM’s gas assets around the Netherlands. The robots are designed to be driven from three central control rooms, each located no more than a few hundred kilometers from each robot. This allows NAM to remotely carry out its remote facility checks while reducing road-safety exposure and the related costs. “I could drive it smoothly, all the way from Rio"
To control the robot, the operator used a gamepad console and the images from the robot’s cameras were displayed on his computer screen. The robot and computer were connected using wifi in Rio and the 4G network in the Netherlands. “I could drive it smoothly, all the way from Rio”, the operator said. “Latency was between 350 and 400 ms, quite stable, and the video streamed perfectly. I could fine tune the robot’s position to peek through a nitrogen plant’s fence.” The ‘Rio trial’ emphasises the practicality of this solution. ExRobotics is a international company specialised in robotic solutions for potentially explosive facilities. It produces robots that can remotely carry out otherwise potentially hazardous safety checks at remote facilities.